THE BROODMARE IS MORE THAN 50% OF THE EQUATION! 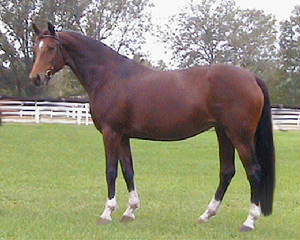 The broodmare is as important, if not more important, to the quality of the foal as the sire. The mares bloodlines, personality and overall health and conformation play a very dominant role in the outcome and success of their progeny. 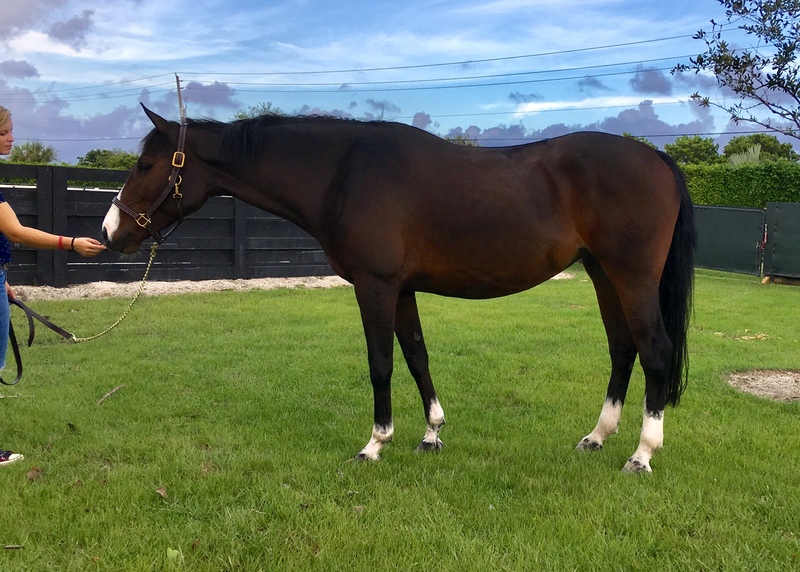 All of our broodmares have excellent, sought after, bloodlines, are successfully performance tested and have either had show careers or are about to go to the show ring. We will be doing quite a bit of Embryo Transfer next season. Please contact us if you would be interested in a customized breeding. Below is the list of our current Broodmares. Click on each picture for a larger view. 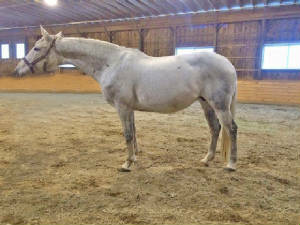 IN FOAL TO BLISS MF FOR A 2019 FOAL! In 2017 her first foal was named a Premium Foal, a Foal of Distinction and named a Stallion Prospect. Was trained as a Hunter and won everytime she walked into the ring! Absolutelt perfect conformation! Our super special mare, by the outstanding stallion Lupicor, is a jumping machine. Has won in both the Hunter ring and the Jumper ring. Has scored 87 and up in Hunter Derbies! Really sweet personality and so comfortable to ride. We are really excited about this cross! One in a million mare. Amazing jump, comfortable and quiet to ride, great mover and absolutely gorgeous! Couldn't wait to get her home to breed. She will have an amazing foal with Bliss MF! Very successful on the show circuit. Champion almost everytime she showed. Took great care of mutiple riders, from young kids to older Amateurs. IN FOAL TO MFCARRY ON FOR A 2019 FOAL! 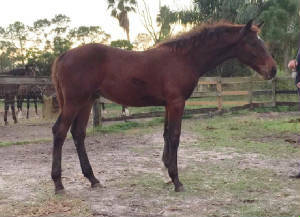 Britney is by Rio Grande out of a Lucky Boy II mare. She had a very successful career in the Amateur Owner Hunters at AA shows on the West Coast, before she was retired due to an injury. Fortunately for us her former owners gave up on her too soon, as she is now 100% sound and being ridden during the early months of her pregnancies. She is so much fun to ride and very comfortable. 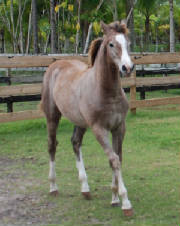 Britney has given her quiet intelligent personality to all of her foals, as well as her incredible athletic ability. 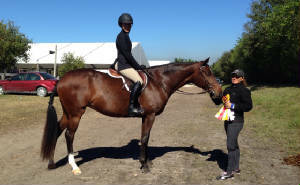 Britney is a 16.3 H Canadian Warmblood who is also approved by BWP, ISR/Oldenburg NA, where she won the Mare Performance Test, and RPSI to date. 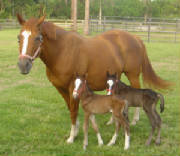 Britney has produced four fillies and two colts so far and they are all Premium foals. #1 BWP Colt in the country! 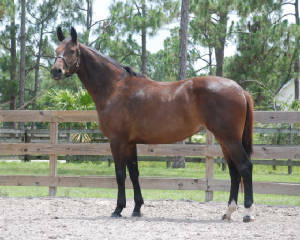 Really thrilled to have this gorgeous mare to breed this year thanks to our wonderful friend Nikki Levy! Christa is everything one could want in a mare; perfect conformation, extradinary movement, a great jump and a lovely temperment. We are really looking forward to this foal! So excited to have this gorgeous mare to breed this year thanks to our wonderful friends and clients the Manigault's! 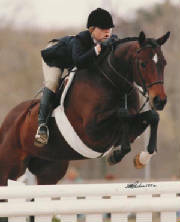 Not only is Tessa a barn favorite, she has wonderful conformation, 10 Hunter movement and a 12 jump! Really quiet and comfortable to ride. 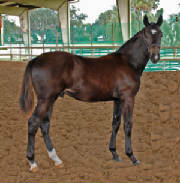 This foal will be the ultimate Hunter with scope for the Derbies! The wonderfully talented daughter of Ladybug, Royal Envy MF (Gamine) is one of the most beautiful movers you will ever see, a gift from her mother, who won three out of three hack classes at indoors one year. Fortunately she also got her jumping talent! What she got from her Grand Prix jumper father, King David, besides more jumping ability, was a calm, almost lazy outlook on life. Out of the box quiet, she is about as comfortable a horse as you will ever sit on and takes no preparation. More good news, she passes on her calm quiet nature to her offspring. A few years after having our wonderful Royal Legacy MF, Royal Envy MF produced our next young stallion Carry On MF by Corlando, as well as a beautiful filly by our stallion Balt'Amour named Blink Twice MF! She will be bred again in the future. Gamine is now spending her time training some of our working students to ride!!! Just gave birth to an outstanding filly by Bliss MF and is back in foal to Corlando! 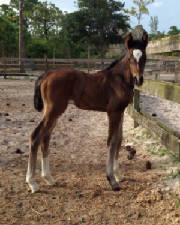 First foal born on the FL farm! Named a Stalliom Prospect by Oldenburg GOV & BWP. 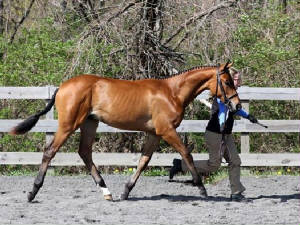 High score foal with a huge score of 88 at her BWP Inspection! 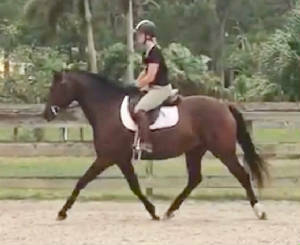 Now under saddle and absolutely the easiest, most comfortable horse ever! Maddie is 16.3 and a 15 mover! Our second filly out of our wonderful mare La Laureate, this mare is super special. Perfect conformation, 12 mover and wow what a jump! Only 15.3 h but a huge stride. Sweetest personality too! Looking forward to breeding her to Carry On MF! We are extremely excited to welcome Center Ice (Sara) to the Marabet Farm broodmare lineup. 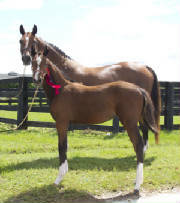 Sara has produced two outstanding high score foals by Bliss MF. We will be repeating that cross for a 2020 foal. 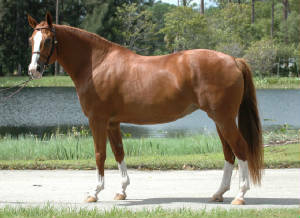 One of very few mares by Torino (Cassini/Heartbreaker), Royal Rayne MF is out of our wonderful Rio Grande mare Britney. After being started under saddle by John Brown, she was trained by our working student Jessica Miller for Dressage basics. Recently she has been started in the jumpers and will continue there, but could easily do the Hunters as well. Her movement is really excellent for the Hunters and her jump is perfect!! 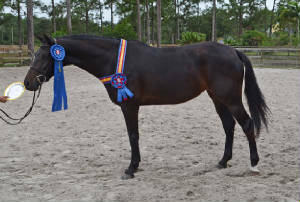 She received the highest score given out for the 4/5 year olds, at the Spy Coast Farm Young Horse show in the Jump Chute competition, of a 9.86. Rayne is 17.2 hands, but very light on her feet for such a big girl. FOUNDATION MARES WE HAVE SADLY LOST. My heart horse is gone. I am beyond heartbroken. Life on our farm wil never be the same. 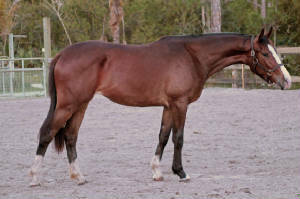 Pistol Envy TFH was the winning filly at the 2007 American Hanoverian Society Inspection at Hedgeland Farm out of 25 other fillies. After announcing her as the winner, Judge Dr. Ludwig Christmann commented, "I am very excited to see such beautiful conformation and movement coming out of the Jumper Breeding Program. Congradulations! Take good care of her as this could be the horse of a lifetime!" Pistol was born at Triad Farm and is now a little over 16.3 hands. In Europe the best mares are held back to be broodmares. For now, this will be Pistol's career! BEAUTIFUL BLISS MF FILLY ON THE GROUND! TIED FOR HIGH SCORE BWP FILLY! FUTURITY WINNER! We have a fantastic filly by Balt'Amour. What a great combination this turned out to be. Will repeat this breeding! National High Score BWP Filly! Without Ornella we would not have the breeding program we have today. She was not only the mother of Bliss MF, but she was the ultimate broodmare in every respect. 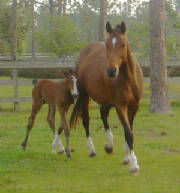 She would take on any foal that was orphaned and needed a new mother. She had her granddaughter at her side still the night she died. This was the sweetest mare ever put on this earth. You were loved so much. Ornella is everything you could ask for in a horse! 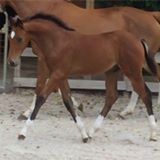 Her bloodlines are impeccable (sire Argentinus was the 2005 Hanoverian International Stallion of the Year) and her conformation and movement are perfection. Comfortable and easy to ride. Jumps easily in beautiful form. As a broodmare she gives her calm, quiet, sensible behavioral traits to her offspring. Imported from Germany in 2004, she is 16 Hands, and Premium in all registries. Registered (and branded) Oldenburg GOV, Hanoverian, Oldenburg NA, & RPSI. She has produced an approved stallion, our Bliss MF, and another stallion prospect, Backstage MF! Ornella had a fantastic filly by Landkönig. She is now winning in the Hunters. The bloodlines of this foal will be almost identical to that of one of the best Jumpers in the world, Lantinus! Ornella gave birth to a full sister to Bliss MF, Optimum M. The most perfect filly ever. She is staying right here with us! Sadly this turned out to be her last foal but her bloodlines will forever make an impact in the warmblood breeding world through her son Bliss MF and all of his offspring. We look forward to foals out of her daughter too. All around fantastic mare. Always gave her all until the day she died. Leelee and all of us miss you terribly. Especially the filly, Pippa, you left behind. Dutch Courage or "Duchess" was a very successful Grand Prix jumper for many years. Retired at 15 years old, she came to us from her owner Shannon Laffin to breed which we so appreciate! 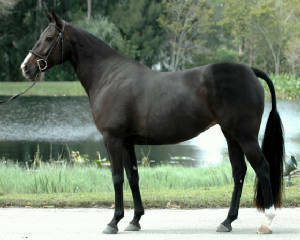 Duchess is a KWPN (Dutch) mare with some wonderful bloodlines. 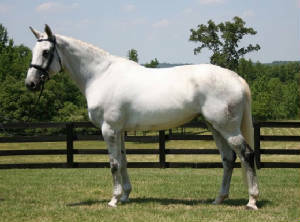 On her sire's side she has the most famous Holseiner bloodlines there are! She is by the fantastic Fruhling who is by the famous Landadel who is by foundation stallion Landgraf I. Landgraf I is by the one and only Ladykiller, one of the most famous breeding stallions in the world! On her mothers side Duchess has very sought after Dutch bloodlines with Marco Polo and Legaat. 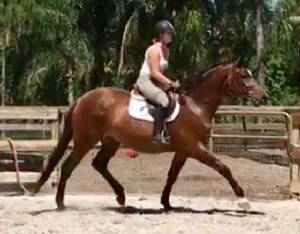 Duchess was imported from Holland as a 6 year old and is 16.3 1/2 hands tall. Duchess gave birth to a stunning Balt'Amour 'black with chrome' BWP colt, Lead Me On M. He sold before he was even weaned! Then she produced the gorgeous Night Moves M by Bliss MF, who also sold before weaning. Now she has given us a super colt by Carry On MF that we are just thrilled about. What a great mare! Duchess gave birth to a very special filly by Bliss MF who we haved given the barn name Pippa because of her huge personality. Total love! Sadly Duchess developed laminitis just before giving birth but we were able to manage it until Pippa was two months old. Then it became too bad and we sadly had to put Duchess out of her pain. Fortunately her best friend Leelee stepped in to be the aunt for Pippa and treats her like she was her own foal. Thank you Duchess for all the wonderful foals you gave us. BWP Site Champion and National Top Ten. Score 80. 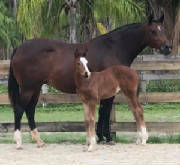 Died of colic, with her 2 week old filly at her side, due to the negligence of Palm Beach Equine Clinic. RIP Lola. Lara and I will miss you forever. We were so excited when we got our Dutch Warmblood mare Tasiola (Lola) from our friend Lara Popovich, who imported and rode Lola in the High A/O Jumpers to great success, to breed. 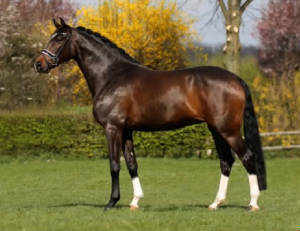 Lola's sire Emillion (by Wellington) has consistantly been producing hugely successful jumpers all over Europe. Many have found their way over here too. Her bloodlines are a who's who of sires: Wellington, Nimmerdor (twice, top and bottom), Lucky Boy (twice, top and bottom), Ladykiller, Alme Z and Cottage Son. Wellington is from the famous stallion Nimmerdor. Nimmerdor has 40 approved stallion sons including Goodtimes, Heartbreaker, Amethist and of course Wellington. Nimmerdor was ranked 29th in the world breeding Federation for 1992-2001. Lola is absolutely georgous as well!!! Perfect top line, tiny head and huge eyes, beautiful neck and nice straight legs. Lola is a bit over 16 hands and very full bodied. Really lovely movement too. But, boy can she jump!!!! She lived a long and wonderful life! My daughter Christy's wonderful show horse, Ladybug won everything! 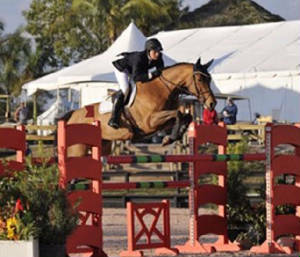 Christy rode her in the Sm Junior Hunters, the Children's Jumpers, and did some Big Eq on her too. Always the hack winner and jumped in perfect form. There wasn't anything this horse couldn't do easily. She comes by this naturally as she is from a long line of extremely successful show jumping mares. Her mother is the multiple Champion Hunter "Born A Lady" owned & shown by Scharme Prevost and also by Joey Darby. 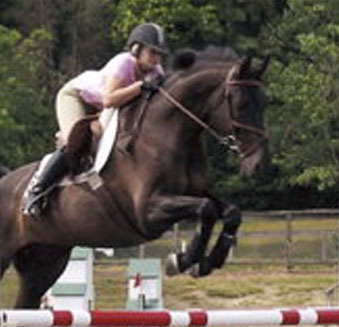 Bred by Virginia & Pappy Moss, Ladybug was born at the Moss' Mile Away Farm in Southern Pines, NC. "Born A Lady" is out of "What A Lady" out of the really famous "Lady Durham", who held the Puissance record for years! When it came time to retire Ladybug from showing we decided to breed her to the wonderful Dutch jumper stallion King David. What a great match they turned out to be. Her daughter Royal Envy is everything we had hoped for and produced our stallion Carry On MF! 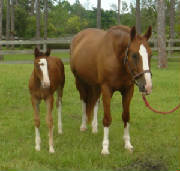 Ladybug is now 28 and is now retired at the wonderful "Retirement Home for Horses" at Millcreek Farm in Alachua, FL. We were lucky enough to get her accepted there before they stopped taking horses from private owners. Please visit their web site http://www.millcreekfarm.org/ and if possible make a donation. I think this is the finest retirement home/horse rescue in the country! We just got the news of Ladybug's passing. She had a wondeful life and she will live on forever in our hearts and through her wonderful offspring. 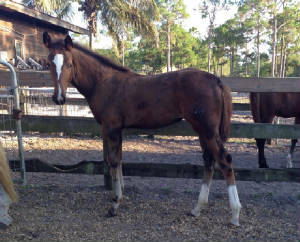 Died of colic with a 2 month old foal at her side due to the negligence of Palm Beach Equine Clinic. La Laureate (Lexi) is a 16.3 H Main Mare Book Premium (MMP) Holsteiner and is Premium in all the other registries we have gone to to date. She is also the Grandmother of our stallion Balt'Amour. Lexi is a very sweet, sensitive horse who bonds to her owner. She is a fantastic mover and jumper. Lexi received 46 bonits and premium status from the AHHA in 2000. As well as Holsteiner, she is approved by BWP, Oldenburg GOV, RPSI, and ISR/Oldenburg NA. Lexi has produced all Premium foals. Her first daughter Papillon, owned by our friend Donna Harrington, is the mother of our stallion Balt'Amour. 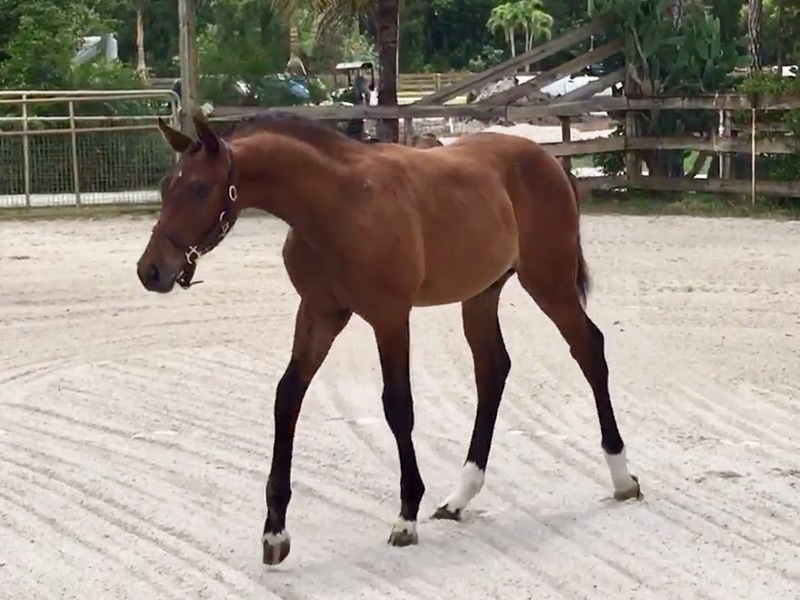 After having a successful Dressage career, she came to us and produced her second daughter L'Attitude MF who was named a Premium and a "Foal of Distinction" by Oldenburg GOV. In 2010 Lexi blessed us with the first daughter by our young stallion Bliss MF. L'Avenir M is everything we could have hoped for and more. Sadly we lost Lexi on October 7, 2010. We are all devastated not only because of all the wonderful foals she had yet to produce, but because we loved her so much. She was a true member of our family and we mourn her loss everyday. She is now galloping across the fields in heaven with her best friend Fergie. Being handled by Dougie Hannam at Devon. Judy Y may you rot in hell for what you did to her. 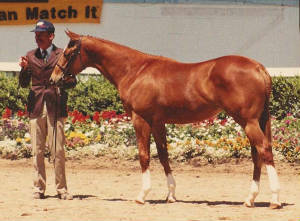 AHSA 1990 National High Score Yearling Filly. Royal Fairy Tale's full story will be on her own page someday soon.